"Wayman Wins Rapping Rendition Celebrating Chi O's Consecutive Fourth First"
Editors Note: Lindsay Wayman of Chi Omega Sorority Inc, performed at the Greek Life Talent Show 2008 on February 27, 2008. Chi Omega! What is in a name? The name Chi Omega makes me think about Jesus Christ! Though Chi Omega is not a religious group but an awesome sorority (minus the drinking, partying, etc), the name conjures in me excitement! You see, those that study Greek will come to know that Chi- stands for Christ! Omega stands for End. Christ is the End but Christ is also the Beginning. Christ is the Alpha and Omega, the Beginning and the End as the Book of Revelation reveals. But Chi Omega is more than a name to me because I had the honor of working alongside some of the coolest Chi Omega’s. I enjoyed working with a Chi O named Megan who was not only on Student Government Board but worked with me at the Pitt News years ago. A Chi Omega named Tiffany was active in InterVarsity Christian Fellowship (IVCF) few years ago. Having Greek Life students involved in IVCF brought me lots of joy because my passion has always been to reach the Greek community too with the Gospel of Jesus Christ knowing with Jesus as their Guide, they would be superb leaders. I am excited to say that currently IVCF has Greek student leaders involved in their chapter even though they are not necessarily from Chi Omega! IVCF also has Greek InterVarsity and currently a Greek Life Bible study offered on Wednesday nights at Pitt. Who can ever forget the enthusiastic Elizabeth Blasi, when she was at the University of Pittsburgh!!! She was the best Chi Omega representative on the Student Government Board that not only I, but Sodexho management fell in love with her enthusiasm which she carries over to this day being a volunteer for Make-A-Wish Foundation and an awesome TV news anchorwoman in Columbus, Ohio. There was a time when there were students bent on destroying Sodexho at the University of Pittsburgh and wanted to use SGB as a means. Blasi would not have any of that and believed in working with Sodexho. To this day, Blasi is talked about among me and higher management, being the pioneer of the SGB food committee. Blasi not only chaired the Food Committee but got extensive involvement from different sorority members and fraternity members. More than anything Chi O’s took an extensive role in the food committee with Blasi as its chair and also the president of Chi Omega. Blasi was instrumental in bringing back the salad bar working with us and what the new Chi O’s are experiencing with Market Central. Blasi did have a great supporting cast working with her such as Joseph Pasqualichio (who also was a DRIVEN slate member and won Senior of the Year Award 2006) and Shady Henien (who also was a DRIVE slate member and won Senior of the Year Award 2007). Both of them give a lot of credit to Blasi. We had excellent Chi Omega FC members such as Lauren Dumm (a micro-blast was named after her in Schenley Café: Lauren’s Microblast), Lindsay Bish and Lisa Babb (who loved praising Sodexho’s food at Schenley), Ellen Malinoski, Missy Michaels, Alli Winn (who went on to become a SGB board member and next FC chair), and Janeace Slifka (who followed Alli to become a SGB board member and the next FC chair). Slifka was instrumental in accomplishing a lot for food services while on SGB board and continues to work with Sodexho marketing and currently serves as Chi Omega’s president. Without Chi Omega representation, for the first time Sodexho got bad publicity at an SGB meeting few weeks ago which I was not surprised at all to see. My friends and I expected it when the FC was not chaired by a Chi Omega anymore. Chi O chairs worked with us and brought things to our attention when things were going wrong instead of to the Pitt News which sadly happened this year without a Chi O chair. With Chi O chairs, when SGB meeting times came, there were only positive things to say about Sodexho because they (Liz, Alli, and Janeace) worked ahead of time with us. I was hoping Amanda Randazza would be the next FC chair! Unfortunately that did not happen. Please, please have a Chi Omega run for president of SGB or board next year and have Chi Omega representatives at the next FC meeting! Chi O’s always got my support because they never disappointed. I am so glad that Elizabeth Blasi, a Chi Omega member became the Senior of the Year recipient in 2005 because she deserved it as FC chair, president of Chi O, and the pioneer of Pitt’s Light Up Night among other accomplishments of Blasi, especially having a passion for the Make a Wish Foundation. Blasi also worked with me closely when funding was originally stalled for a Campus Crusade for Christ event when they wanted to bring Joel Rosenberg to the University of Pittsburgh. Eventually, with her help, the funding passed and Rosenberg came. Blasi was definitely driven in a positive way. Speaking of driven, SGB’s DRIVEN slate swept SGB elections three years in a row with a Chi Omega on board. It is sad this is the first year that a Chi Omega did not contest to be on SGB board or to become Homecoming Queen. Sometimes it is just one person that can make us love an organization! For me it started with Megan and continued with Liz! Even after Liz graduated, Chi O’s still rule! Chi O’s have been the only sorority that have introduced their new pledge classes to me each year since Liz graduated. After Liz graduated, Mistica Labrasca continued the tradition as president. I guess it has become a tradition. Chi O’s are the only sorority that I know 99% of the members by name since 2005 and 98% of them are my facebook friends too. Chi Omega has a religious meaning for me because of its name but it is more than that and that is exemplified in their members who show academic excellence, have campus involvement, and are difference makers. A former president had asked me if I wanted to be the sweetheart of Chi Omega at one time but honestly I did not know what they were asking so I hesitated at the time even though I love the Chi O’s. Three seems to come hand in hand for Chi Omega’s! Chi Omega became the first sorority to win Homecoming Coming Queen for 3 years in a row (So Mi Yun, Lindsey Farell), have a SGB board member represent the students for 3+ years in a row and be Food Committee Chair (Elizabeth Blasi (2X), Alli Winn, and Janeace Slifka) and winning Greek Talent Show for 3+ years in a row (Brittany Taylor, Lauren Splane, and Lindsay Wayman). Sorry, Lindsay that I did not give you first place in the contest but you still won 3-1. As much as I love you all Chi O’s, being a fair judge has always been more important to me and pop music always ruled over rap for me unless the rap was a popular one being acted out like last year. Brittany and Lauren won not because they were a CHI O but because of their rendition of popular songs done well. I am still happy for CHI O’s. I know more CHI O’s than any other sorority sisters but this is not to say that I don’t love reaching out,with the love of Christ, to all sororities and fraternities. Only one sorority is catching up with the CHI O’s for me to know their names and will let you all guess which one that is. The more names I know, the more connection I feel to the CHI O’s. My favorite combined colors have been red and yellow! My favorite bird has been an owl! My favorite flower other than giving someone a rose has been a White Carnation. Was I in a surprise when I found out today that the owl and the white carnation were representative of Chi Omega! I already knew the colors were! Chi O, You are on the Go! Without the vote of a church layman! Holding on to your PENCILS with stride!!! 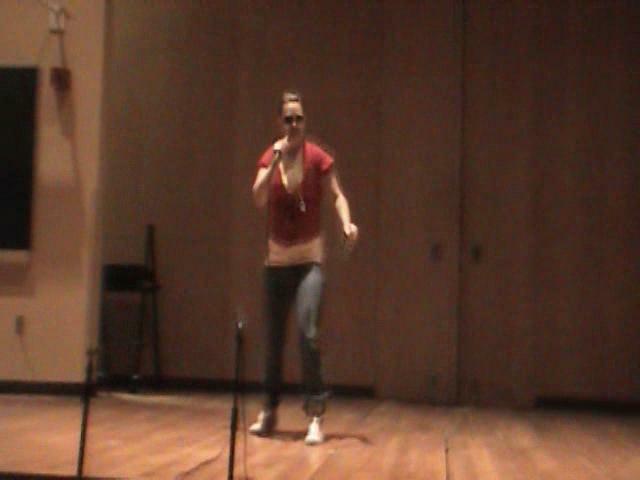 Other Greek Talent Show performances! Keep checking! You never know when yours will be online!